Aleksander Kostopoulos, a Norwegian guy with greek roots, is one of the most impressive drummers, I’ve ever seen. It’s awesome with how much energy and passion he plays his instruments. I believe he could make a good sound of almost everything! 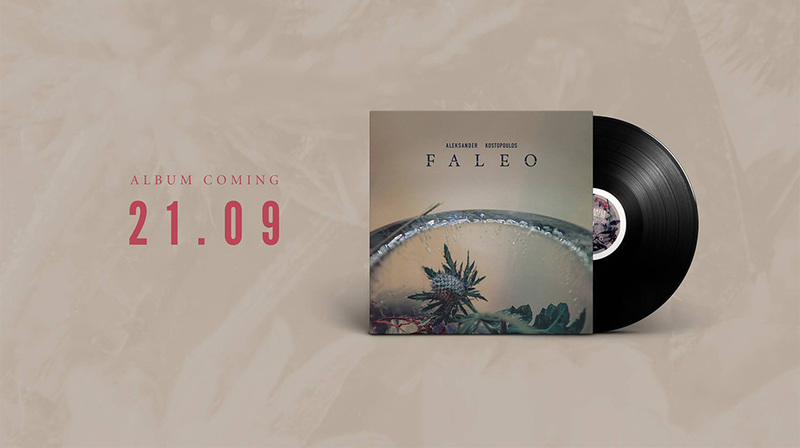 So I was looking forward very much to his first solo album “Faleo” that is released today. But Aleksander is one of the most active drummers form Northern Norway and so it happens, that I came across him very often while looking for new Scandinavian music. As I read about his solo project, I became curious and wondered what to expect. I listened to the two already released singles “Saklageto” and “Kusolda”and other than one may think, are these songs not dominated by rhythmic drums and percussions, but carries you away into an experimental sound experience of athmospheric electronical tunes. An exceptional and new, fresh music that could be located somewhere between ambient, indie and pop music with a little bit of Jazz. This special sound is reflected in the name of the songs by not using real words but fancy names that just shall describe the emotions they create. And it’s beyond questions, that – as a true artist and singer-songwriter – seven of nine songs were recorded live in the studio with Aleksander managing samples, drums and vocals at the same time.